Written by Cal Korf, the typewritten missive to Department of Kinesiology and Physical Education Chair Chad McEvoy came in response to an alumni e-newsletter sent to thousands of KNPE graduates. Korf had just completed his student-teaching hours at West High School in Rockford, the big city a few miles east of his small hometown of Winnebago. His timing was perfect. He was fortunate enough to accompany legendary Coach Alex Saudargas and the boys basketball team “downstate” to win the 1955 Illinois State Championship, a feat Rockfordians continue to celebrate nearly 65 years later. And he’s got a great yarn about that trip, one that involves the coach’s pregnant wife, the plan to have the team name the baby who was born during those finals and how the cheerleaders insisted that they were the ones to draw a name from the hat when Alice gave birth to a girl. But Korf’s biggest story was yet to begin when he graduated from the Northern Illinois State Teachers College. It’s a tale about what he did with his life – the spoiler is that he never did teach Physical Education – and how four years in DeKalb prepared him for a life of adventure around the world that he once had tried to avoid. “During the Korean War, my roommate signed up for the National Guard. He said it was a really good deal. You get paid; you go to meetings now and then. But then his unit got activated, and he went to Korea. I said, ‘Holy moly.’ That was my sophomore year,” Korf says. Two years later, as his 1955 commencement drew near, he felt confident that military service was not coming next. Confused, Korf visited the U.S. Army Recruiting Station in Rockford. He knew the sergeant there: a fellow Winnebago High School graduate a few years older than he. Arriving at Fort Leonard Wood for basic training, he saw a familiar face. As his three-year commitment eventually grew into 25 years, he first was stationed in Germany, where he worked with Czech refugees, translated articles in the Rudé právo newspaper for his higher-ups and became “pretty fluent” in the foreign tongue. Following his graduation from Officers School, and his commissioning as a second lieutenant, he moved to Washington, D.C. to serve in the 116th Intelligence Corps. 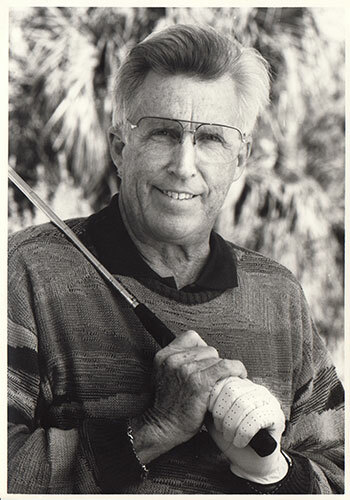 When the Berlin Wall went up in 1961, Korf returned to Germany for the second of his three tours there. His next assignment brought him back to Washington, where he served in a premier intelligence unit with a global mission. 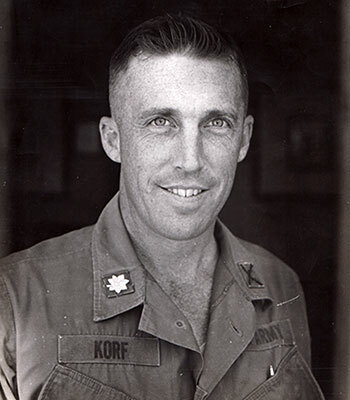 Korf’s Army career took him back to Germany for a third and final time; to Bangkok, where he served for almost three years; through two tours of duty in the Vietnam War; back to Paris for a six-month temporary assignment; and again to D.C. It was there, as a lieutenant colonel, that he accepted his final transfer – to Hawaii. Five months later, as Korf watched that GS-12 emerge from a Hawaii courthouse with “his head down to his chest,” he knew he’d done well. That general and Korf had become good friends, meanwhile, and Korf was able to name his next responsibility. He wanted to manage the Army’s trio of golf courses in Hawaii, a request that raised the eyebrows of his boss. No residence halls existed when Korf arrived at NISTC. “That was probably a good thing,” he says with a laugh. Also in short supply were faces of color. 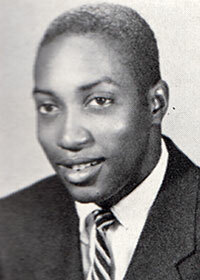 Korf could count the number of African-American students on one hand; among them was Ted Wright, Korf’s sophomore-year roommate at the newly opened Gilbert Hall. Before the pair became roommates, however, Korf had an encounter that today is unimaginable. “The Dean of Men met me at the entrance coming in to register. He said, ‘I’ve assigned Ted Wright as your roommate. Do you have a problem with that?’ I said, ‘No, I don’t have a problem,’ ” Korf says. Most of his DeKalb memories, though, focus on sports. A self-professed “jock all the way through high school,” Korf was inspired by his high school basketball coach to study Physical Education, even if the coach had urged him to become an undertaker instead. 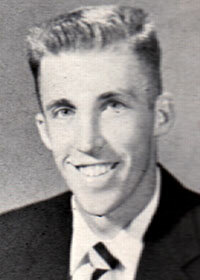 Gil Hertz, coach of the NISTC men’s basketball team, had made it clear that anyone wanting to try out for the squad should train with the cross country team during the fall. “I was always ultra-competitive, so when they had a cross country race, I finished second. The coach said, ‘Draw your uniform,’ and I said that I was only there because of basketball. He said, ‘I’ve already talked to Coach Hertz, and if you don’t run on the team, then you’ve already been cut from the basketball team,’ ” Korf says. Korf joined the team, as well as the track team, where he thrived for four seasons under legendary coach and NIU Athletics Hall of Famer Carl Appell. Ironically, he never played basketball. Cal Korf wins a race. 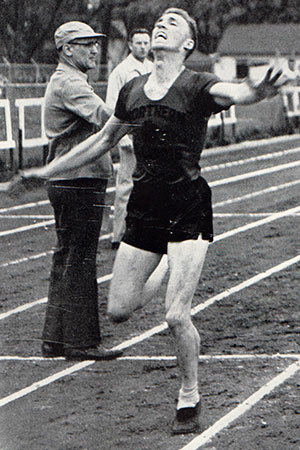 On track, he ran the quarter-mile for all four years, anchored the mile relay and, when needed, ran the 440, the half-mile and the mile. Appell, who also taught Kinesiology courses, was a taskmaster in and out of the classroom. When one sprinter skipped practice without permission to attend a birthday party, for example, Appell showed no mercy the day after. Korf tested those waters himself, however, during the weekend of an indoor track meet in Chicago. “It was maybe my sophomore or junior year. I told Carl, ‘Well, we’ve got an intramural basketball tournament, and the TKE team is going to be in the semifinals and maybe the finals.’ I said that I really needed to play; that if I didn’t play, they didn’t have a chance,” he says. 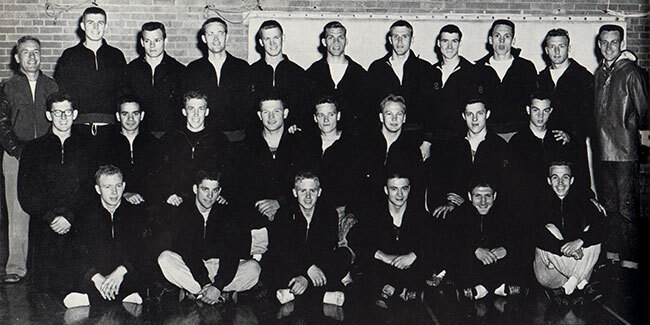 The NISTC men’s track team, 1955. 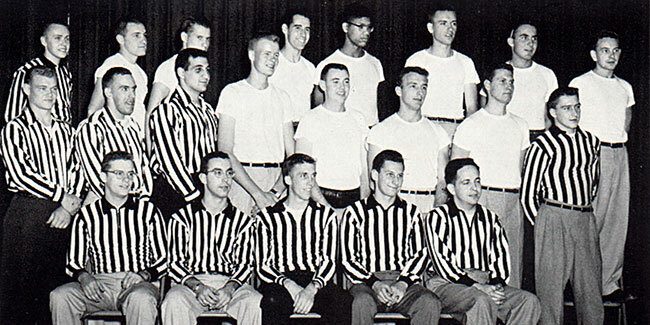 Korf is third from the left in the middle row. Florida beckoned Korf and his wife, Karen, after military life came to an end. Despite that, Korf tossed his name in the hat. “I knew there wasn’t any money. Several of the people who applied were asking for $35,000 or $45,000 as a starting salary; I had volunteered and ran the association for two months during the summer, and I knew there wasn’t any chance for a salary like that,” he says. “When I had my interview, I addressed the board and I said, ‘I know what the financial situation is here. I will take the job for $1,000 a month and do that for six months. If you’re satisfied, then we will renegotiate and do a real contract. If you’re not happy, you won’t have lost much by then, and you can just take one these other guys,” he adds. 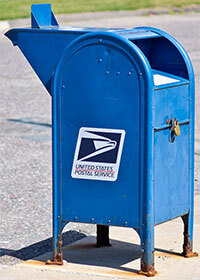 After his second retirement, the mailbox promptly brought another opportunity – and, although not apparent at the start, Career No. 3. Korf had received a letter inviting him to join the Berlin U.S. Military Veterans Association, which he did. Soon afterward, he got a phone call from the group’s president. The secretary had died, the president said, opening that position. Would Korf take it? The strategy continued on to other generals and, one year later, membership already had soared to more than 2,000. 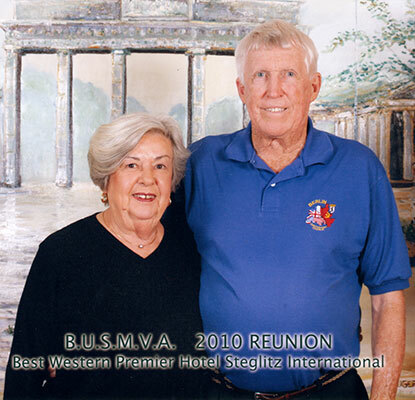 Yearly reunions took place in Berlin, but when Korf heard that some veterans had to borrow money to attend, he decided to host the get-togethers every four years in Germany with U.S. locations in between. He also was inspired by that situation to coordinate and offer after-reunion bus excursions around Europe to make the trips to Berlin worth the cost for the members. Destinations include Belgium, Budapest, Ireland, Italy, Normandy, Paris, Prague and Vienna. His final tour took place in 2017. Now retired for good, and living in Nokomis, Fla., Korf still thinks about NIU and even stays up late to watch Coach Rod Carey’s Huskie football squad battle on ESPN.